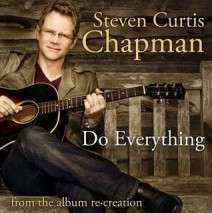 "Do Everything" is a song by American CCM singer Steven Curtis Chapman. The song was released as the lead single from Chapman's seventeenth studio album, Re:creation. "Do Everything" is a Contemporary Christian song with a length of three minutes and fifty-two seconds. ↑ Johnson, Jared. "Re:Creation - Steven Curtis Chapman". Allmusic. Rovi Corporation. Retrieved 21 September 2011. ↑ "Year-end Christian Songs chart (2011)". Billboard.biz. Billboard. Retrieved 9 December 2011. ↑ "Year-end Hot Christian AC chart (2011)". Billboard.biz. Billboard. Retrieved 9 December 2011. This article is issued from Wikipedia - version of the 9/3/2013. The text is available under the Creative Commons Attribution/Share Alike but additional terms may apply for the media files.